I love trees, fractals, and polymaths. Hence, I found this article on the branching of trees interesting. Basically, the thickness of all the branches of a tree combined are the same at any height. So if the diameter of the trunk is say 3' near the ground then all the branches at any given height will have a cross-sectional area of 3'. An app that gets around the NYT's firewall. It works flawlessly and it's free. If I wasn't doing architecture this is something I'd pursue... intaglio-type photo printing. This guy, Justin Myer, is an acquaintance of a close friend of mine, Justin Santora, and they've traded some work in the past - it's really nice stuff. The process is really fascinating too. Some truly fantastic older photos. Architecture I've been looking at: small house, wood, video... how the? With boilers! The economy is bad. It's going to remain that way for the foreseeable future. No recovery, any time. Get it? Not happening. If you hear otherwise it's just spin, lies, ignorance, or some combination thereof. The fastest way out is of course spending (aka stimulus). Doesn't matter how it happens. First, a history lesson then a more recent one. Read them both or do not talk to me about the economy. Wonk note: 2.5% of GDP is huge. The US needs 2.5% (or so) real (as in, above inflation) GDP growth just to keep up with population growth (same GDP with more people equals less income to split up). That's correct, anything less than that and our standard of living per capita is actually going down. With growth right now hovering right around the 2.5% area anything that adds to that helps dig us out of our collective hole. How to make a zip line. Hell yes. I'm a firm believer in simple solutions. So is this former Forumla One designer who made a car that gets 350 MPG. Nothing crazy, it's just really light. Think about it. The typical car today is about 3,000 pounds - to move what, a 150 or 200 pound person? My bike weighs 20 pounds and moves my 180 pounds. My bike requires 180 times (I know the numbers are rough, but it proves a point doesn't it?) less mass to move me. I'm tired of writing so I'll leave you with this. 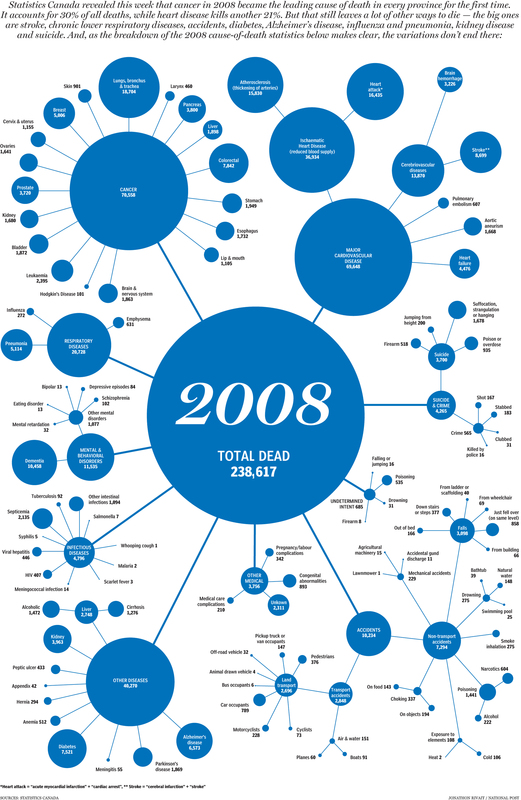 A beautifully made graphic of causes of mortality from 2008. It's official, the world is now so safe that most of us die from cancer.